Grand Teton | Keeping Wilderness WILD! You are currently browsing the tag archive for the ‘Grand Teton’ tag. For the second time in as many years, a bill that would open certain waterways within Yellowstone and Grand Teton national parks to “hand-propelled vessels” is making its way through the legislative maze in Washington, D.C. Introduced by Congressman Cynthia Lummis and pushed by the kayaking and packrafting community, the new law is aimed at granting this single user group access to more front- and backcountry waterways in our two national parks. As written this bill directs “the Secretary of Interior to promulgate [to proclaim formally or put into operation] regulations to allow the use of hand-propelled vessels on certain rivers and streams” in the two parks. Instead of having our park’s waterways managed by resource professionals abiding by the service’s Organic Act, this bill would set as policy the desires of a special interest group teamed with Washington politicians. This is a terrible way to manage our national parks. A leading force behind this legislation is the Jackson-based American Packrafting Association. Its website presents a list of rivers and streams it wants studied for floating — 39 in Yellowstone and 13 in Grand Teton, totaling 475.2 miles. Included are portions of the Gros Ventre River (the park-elk refuge section), Cottonwood, Ditch, Spread, Pacific, Pilgrim and Lake creeks, and parts of the Firehole, Madison, Gallatin, Gardner, Lamar, Lewis, Nez Perce, Pebble and Slough creeks in Yellowstone. A singular (unwritten) goal of APA is to gain access to the 36-mile stretch of the Yellowstone between Seven Mile Hole (a few miles below the Lower Falls) and Gardner, with the grand prize being the 20-mile segment known as the Black Canyon. If these streams are opened to whitewater adventuring, iconic vistas enjoyed by millions of visitors each year will no longer seem wild and untouched. Instead, visitors will be distracted by scenes of florescent technology cutting through the heart of some of our nation’s most treasured landscapes. Gone will be that glimpse of what primitive America looked like when the land was untouched and imaginations were free to contemplate creation’s many wonders. Tranquility and the ability to be inspired by wild, uncluttered vistas are values worthy of protection, too. These are values cherished by millions of visitors each year. Values worth protecting for all future generations. So much would be forever lost if packrafting, kayaking and floating were allowed on these few, last free-flowing waterways. And all because one special interest group wanted another adventure-filled playground. Proponents argue that this law will only cause the parks to “study the feasibility” of floating select streams, and that this study needs to occur because this issue has not yet been properly analyzed. Both assertions are false. As written, the bill would require the parks to divert their under-staffed management teams away from day-to-day park operations and have them conduct an expensive NEPA analysis of all floatable rivers and streams within their jurisdiction, and to create regulations allowing certain streams to be opened to floating. The APA claims that it only wants 42 “select” waterways studied. A NEPA process would likely require that all major floatable segments and all types of floating devices be analyzed. APA does not control how NEPA works. In part because of heavy pressure from a few individuals in the late 20th century, Yellowstone officials conducted a NEPA analysis of this very issue. The document signed in 1988 recommended that: “Due to the high level of potential impact that river boating has on the biophysical environment of Yellowstone National Park, the No Boating/No Action alternative is recommended.” The recommendation was based in part on the fact that abundant whitewater opportunities occur outside the park. Apparently APA has chosen to ignore the previous findings and that the study even occurred. Every time we extend our self-indulgent and technologically enhanced desires deeper into the backcountry — whether it be opening waterways to kayaking, carving turns in remote backcountry or paving trails through rich wildlife habitat — we force wildlife into smaller corners of our remaining undisturbed lands. How many times, how many ways can we keep squeezing our wildlife and still hope to have sustainable populations? Our stewardship responsibilities demand that we examine our actions and impacts generations into the future. Not just for our benefit but, for the future of the land and the wildlife it is home to. There is no other Greater Yellowstone. Our parks should be the most protected and most intact parts of this greater landscape. They should not become pleasuring grounds for a select group of adventure seekers wanting to push their new technologies deeper into our wildlands. Why is it that we seem to want to conquer everything like dogs running feral across the landscape? Can we not leave a few of our planet’s remaining treasures free from change? Conservation has its deepest meaning when motivated by selfless altruism, not special interest desires. Dr. Franz Camenzind is a wildlife biologist turned filmmaker and environmental activist. In his career he conducted numerous wildlife assessments, often focusing on threatened and endangered species. Serendipitous opportunities lead him to a long career in the documentary film industry where he produced films on coyotes, wolves, grizzly bears, pronghorn antelope, giant pandas and black rhinos. Although now enjoying retirement in his Jackson, Wyoming home of 44 years, he is still very much involved in local, regional and national environmental issues. He spent his last 13 years as Executive Director of the Jackson Hole Conservation Alliance. Prior to that he served on its board for 13 years and was one of the founding board members of the Greater Yellowstone Coalition. 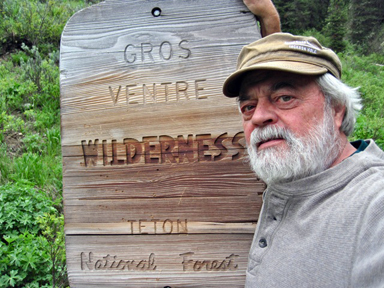 Dr. Camenzind serves on Wilderness Watch‘s board of directors.